Hey, y’all! Meet Nannie Doss. Over a period of nearly 30 years, this cheery serial killer chopped multiple limbs off her own family tree, with body count that’s alleged to include four husbands, her mother, one of her mother-in-laws, her two sisters, two of her children, a grandson, and a nephew. Her weapon of choice: arsenic, which she stirred into stewed prunes, coffee, or moonshine. The picture up top sure doesn’t scream “stone-cold murderer,” does it? Nannie was born in 1905 in Alabama; her parents prioritized farm labor over schooling, and when she was around seven, she suffered a traumatic head injury, the aftereffects of which would plague her the rest of her life. As a teen, she loved reading romance magazines, a trait which may have led her to get married at age 16. It was not a happy union, though Nannie’s first husband managed to survive it (later, he’d realize his incredible good fortune), and it produced four daughters. Two of the girls died of food poisoning ... or so everyone assumed at the time. After that marriage ended, she wed again. Four more times, with four dead husbands in her wake. Along the way, she was also suspected of taking out two of her daughter Malvina’s young children (including a newborn; that’s a worried-looking Malvina and her other kids in the photo below), and the cavalcade of others listed above, all of whom seem to have perished under “mysterious” circumstances after spending time with Nannie. Her first attempt to kill him with arsenic-laced prune cake failed, and he spent a month recovering in the hospital. When he returned home, she used her tried and true “arsenic in coffee” method, and Doss died soon afterward. This final murder would prove her undoing. The physician who had treated Doss suspected foul play. He convinced Nannie to allow an autopsy by telling her that it would save lives in the future if he could determine what illness had caused the death of her husband. When he found enough arsenic in Doss’ body to kill a horse, he alerted the police, who arrested Nannie and charged her with murder. Under interrogation, and in return for being able to keep a romance magazine, Nannie confessed to killing her husbands. Exhumations of several bodies confirmed that they had died of rat poisoning or arsenic. Despite her jailhouse confessions of other killings, she was tried only for the murder of Samuel Doss. Judged sane and able to stand trial, she pled guilty and received a life sentence. Her string of murders would have been enough of a curiosity, but she made an impression with her upbeat demeanor. She seemed to enjoy her notoriety, and even joked about her dead husbands with the press. 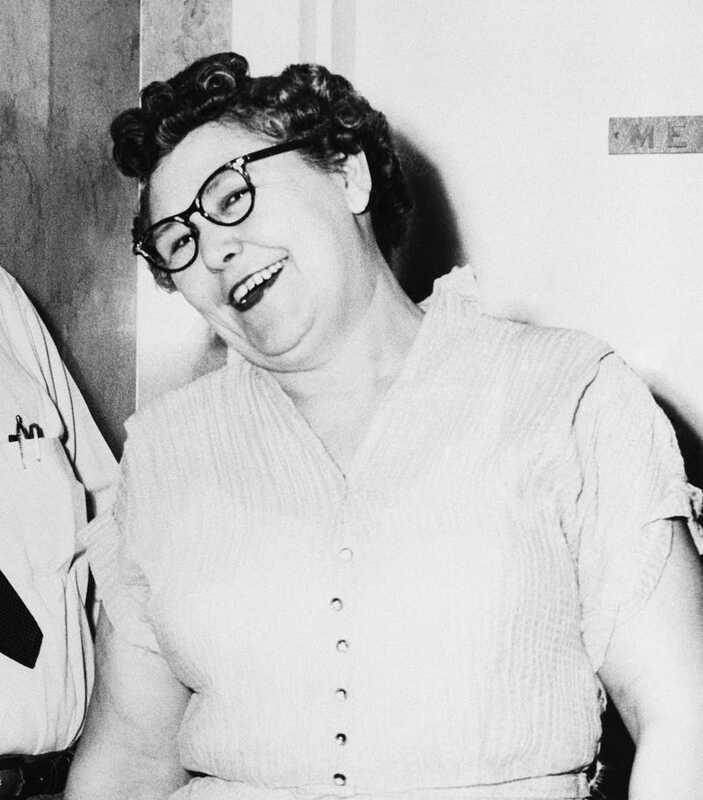 From top: Nannie Doss smiles after receiving a life sentence on June 2, 1955 for the rat poison murder of her fifth husband Samuel Doss, one of four she admitted disposing of by using rodent killer. After the district court action she said, “I have no hard feelings.” Doss with her daughter Melvina and two of Melvina’s daughters on May 31, 1955. Doss on Nov. 28, 1954 with with Tulsa police commissioner John Henderson (left), Capt. Harry Stege (standing) and County Attorney J. Howard Edmondson. Credit for all: AP Photo.